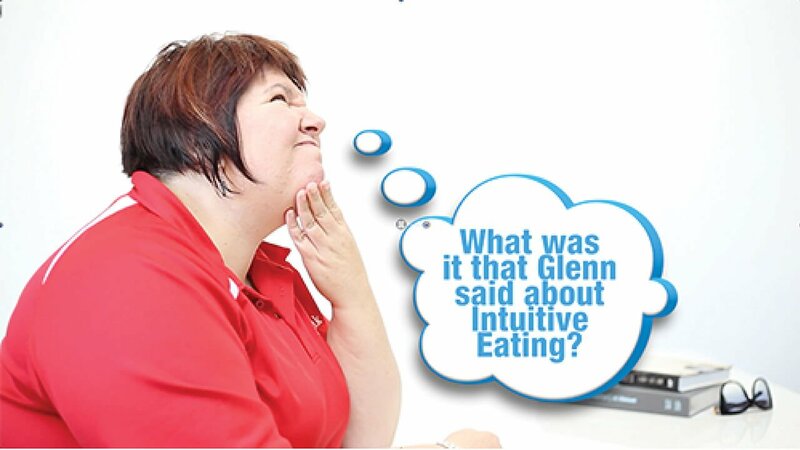 In this Thursday Therapy episode, Glenn Mackintosh introduces the five principles of intuitive eating, shows you how to tell if you are really hungry or just wanting to eat, and helps you identify and overcome non-hungry eating cues. That is a really great question, Corinne. Mindful and intuitive eating, I’ll use the terms interchangeably, they’re really a whole new way to take care of your eating. It’s a real paradigm shift in the way that you look to take care of you yourself with your eating. So, when you’re learning how to do that, naturally, it takes a while to understand it in its totality and figure out how it applies to you, so let’s quickly recap the intuitive eating principles. Firstly, you’re allowed to eat all foods, so we consider food as morally neutral and you’re free to eat whatever you want. Secondly, we pay attention to food and eat distraction-free. Thirdly we listen to your senses of hunger and fullness as your body’s natural signs to start and stop. Fourth, and we’re going to talk a lot about this later, we notice and transcend a lot of non-hungry cues for eating and fifth, we have food choice body congruence, so we’re eating in a way that our body likes. I don’t want you to think of these as rules, I want you to think of these as principles that all work together and you can dance around and experiment with the principles, so let’s apply this to a particular food craving. So, as part of your question Corinne, you actually asked one of the most important questions is, “Am I hungry?” Sometimes it’s really difficult to understand is my body craving food or is it my mind craving food that can get really collapsed and muddled up, so what I’m going to do is, I’m going to provide you with this link to our mindful, intuitive eating journal and on the back here you’ll see a hunger and fullness scale and let’s do a little exercise now. We’ll put that hunger and fullness scale up on the screen and you can just start to check in with where you are now. So, if I check in with myself, I’m about a 5. I’m not hungry and I’m not full. What you’ll often find is that once you pay attention, you will be able to understand whether you’re hungry or not. For a lot of people that I see and I’ve been speaking to a few clients about this over the last couple of days, they say to me that it’s quite hard to identify whether they’re full or hungry or in-between but when you listen the signals are there. At the start, they’re just little whispers but when you do pay attention and when I do this exercise with people in session, ninety-nine times out of a hundred, you can actually listen to the body, it just takes that a little bit of time. Actually, you know what I’m going to do guys, I’m going to talk you through the mindful intuitive eating journal, so if you want to do a bit more of it you totally can. Don’t freak out, it’s not a food diary, it’s not to help you to regulate your calories or designed to help change your eating, it’s actually just designed to help you follow those five principles. So, the first column here is about what’s going on before you’re eating, that’s where we’re starting to notice the non-hungry cues. This next bit is the hunger and fullness, so you draw a line between where you start and when you stop eating, so you’re noticing when you’re starting and when you’re stopping. This next column is for the food and the amount, I think stay away from calories, it’s just so you can create mindfulness around what you’re actually eating. I do have a little note there that it says, if eaten, because sometimes after noticing while you’re eating and noticing your hunger and fullness, you won’t want to eat the food, which is of course totally cool and this last column here is where you’re noticing that food choice body congruence. So, what actually happens to me after I’m eating. So, for people who are extra keen, you do this for a couple of weeks and you’ll naturally build your mindful intuitive eating skills, don’t worry if you miss a day, don’t worry if you can’t really get to one part of the entry, any part of this that you fill out is a total bonus because it’s not about regulating your overall calories, it’s about building these mindful eating skills that once you learn them, you can’t unlearn. So, if you’ve identified that your body is hungry, great, your body is just sending you a really simple signal that it needs nutritious food. Now I’m not going to tell you what nutritious food is because you know and I know that you already know how to eat nutritiously. If you are still feeling like eating, this is where we start to develop an awareness of the non-hungry cues, so what my clients tell me about developing this awareness is that it does take time and effort and attention, but once they get there, they feel really empowered to develop really workable solutions to overcome those cues. So, what I’m going to do is I’m going to give you some of the more common ones and I want you to experiment with understanding these and some of the possible solutions that work for you between now and next Thursday Therapy. In fact, I even want you to comment below on your experience. Sleep is a really big cause of food cravings, so if you’re not getting enough sleep, if you’re getting too much sleep, if your sleep is irregular or if your sleeps really interrupted, then that can cause increases in your ghrelin, your hunger hormone, and decreases in leptin which is your fullness hormone so obviously that’s really bad for food cravings, my answer there is get better sleep, around seven to eight and a half hours a day. There could be physiological reasons for your cravings so there may be things to do with gut bacteria, your specific hormonal profile or any medications that you’re on that can be affecting food cravings, so my best answer there is see your doctor, see your naturopath or see another trusted health professional if you feel like this is going on explore it and see what happens to your food cravings. It’s possible that nutritional deficiencies are actually causing food cravings, so if you’re hungry you’re not getting enough nutrition or you’re missing out on certain vitamins minerals or macronutrients, it can create cravings, so my advice there would be to go and see a dietitian or nutritionist, just make sure that that dietician or nutritionist is not going to put you on a calorie controlled meal plan or reduce your calories because they could be then inadvertently increasing those cravings. Of course, there’s a very good chance that your food craving could be psychological, some research tells us that up to 70 percent of non-hungry eating is emotionally based. My answer to help you there, is I want you to do some free association writing, so just take a blank piece of paper and a pen and start writing and that’ll help you get in touch with what’s going on in your subconscious. You’ll start writing about, well this is a weird writing exercise or this happened to me today and then you will end up with, I can’t believe that person at work said that to me I’m always disrespected, I feel so blah blah blah and then you’ll be able to deal with that material a bit better, so first help you understand the psychological cues, practice some free association writing, that’s a really good point of call to help you understand what’s going on for you. Naturally, we don’t want to overlook that a lot of non-hungry eating is habitual. The force of habit is not to be underestimated and we all have different habits strengths, so some of us build habits really quickly and we get out of habits really quickly and other people have habits that last for ages and are really tough to get through. So, what I would suggest, if you just identify but actually not this is just habitual; every time I get home or every time it comes a certain time of day or every time when I see this particular type of food, this is just the script that I go into, what I’d encourage you to do is write down the script, that’s the script that you as the actor do without even thinking you’ve rehearse those lines really well, you know it to a tee, then write down an alternative script that is workable for the main character and will yourself into doing that script. It’ll take quite a bit of energy to do that but once you develop the new script, as a habit, then you will transcend that habitual eating cue. Also, it could be that your brain is just addicted to that substance, so sugar is obviously quite addictive, we know that it can be as addictive in rats as cocaine, although we haven’t done the research in humans because I don’t know if you could give the humans cocaine but we also know that that combination of 50% fat, 50% sugar gives us that beautiful bliss point of sweetness, that perfect mouth feel, that gets our reward circuitry just going crazy. So, it may be for you that to develop a more intuitive eating style in the long term, you actually have to figure out a way to really reduce the amount of that substance in your diet, in your bloodstream and in your brain, so how do you do that? I think retreats are really good things to do, going somewhere where your body can detox from those things. I think sometimes detoxing your body for a certain period of time can be a really good thing to do but you have to be very mindful of why you’re doing that, it’s not a weight-loss thing, it’s actually something you’re doing to help improve your brain chemistry, so you can eat in a healthier way long term. So, that one is a high degree of difficulty. A really good one if it’s sugar, is you can start to reduce the overall sugar in your diet, in a way that’s right for you, by looking at some of the added sugars because most of us are having a lot more sugar in our diet than we actually realize. All right, excellent, so just to recap mindful eating is not just eat what you want, there are five principles and you need to dance around all of those principles. To make this cup of coffee I need the right amount of milk, I need the right amount of coffee, I need the cup, if I have only one of those then I’m not drinking a good coffee and I want you to think the same about your mindful eating, it’s not just one principle, it’s a combination of principles that work together. Then I want you to think about the hunger and fullness, you’ve got a beautiful scale that you can check in with yourself, as a simple rule you might ask yourself, am I hungry? And think that being hungry is like being in love, if you have to ask, “Am I?” and you’re not sure of the answer, you’re probably not. If not, we’re going to look to those non-hungry cues. Now, I can’t tell you unfortunately, I’d love to be able to, I can’t tell you what yours are but I can tell you how to get there and if you play around if you experiment, you take that time you will get to finding them I’m sure of that. So, thank you for paying attention to another Thursday Therapy. Before we finish up I want to give a quick plug to our weight management psychology page. I want you to give that page a like, we’re posting positive messages every day on the psychology of eating, movement, weight and body image. As you know there’s a lot of rubbish out there on social media and a lot of negative stuff, but I think you can put the weight management psychology posts kind of in the posts of like that, you know, the cute puppies that make you feel good, some of that post will make you feel good. I saw a really cool one with a monkey who had befriended a cat, it kind of opened my mind, so some of our posts will open your mind a little bit, so please give the WMP page a like and until then I will see you in a couple of weeks for our next Thursday Therapy. Hey Buddy!, I found this information for you: "EPISODE 16 Am I Hungry (or Do I Just Want to Eat?)". Here is the website link: https://www.weightmanagementpsychology.com.au/episode-16/. Thank you.